El Rodeo, a small community to the north of Volcan de Fuego, covered in ash. Entire towns have become tombs of ash following Volcan de Fuego’s eruption earlier this week. Rescue and cleanup efforts have continued, but rain is in the forecast and could hamper them as it turns ash into viscous sludge. And the scenes being captured by aerial photos look straight out of the upside down. Volcan de Fuego is no stranger to eruptions as one of Latin America’s most active volcanoes, but Sunday’s violent outburst was more extreme than its usual pyrotechnics. The eruption sent ash streaming into the sky before tumbling down its flanks in a superheated highway of destruction, which volcanologists call a pyroclastic flow. 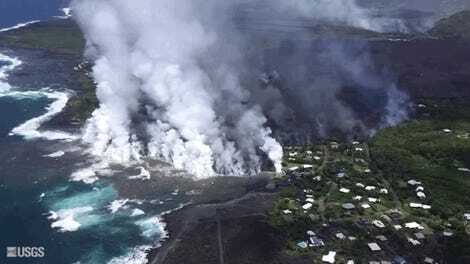 At least 99 are dead according to the latest death toll, and 12,000 have evacuated to safety as the volcano continues to rumble. 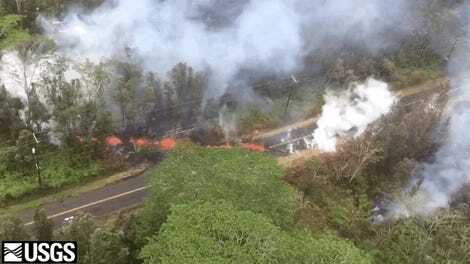 A smaller pyroclastic flow tore down the mountain’s south flank on Tuesday and prompted the closure of a highway in the vicinity according to the AP, though it wasn’t as destructive as Sunday’s big one. 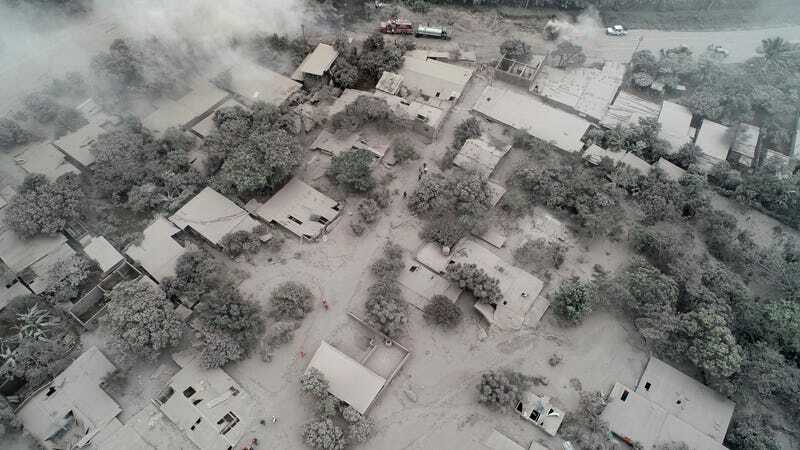 Local residents also told AP that villages in the shadow of the volcano were covered in up to three meters (10 feet) of ash. Meanwhile, aerial photos have revealed that the trees, fields, houses, and stores that typically create a vibrant landscape of bright greens, pinks, and yellows have turned a ghostly gray. Damage from Volcan del Fuego near El Rodeo, Guatemala. An aerial view of damage near Escuintla, Guatemala. Rescue workers search the wreckage of homes in El Rodeo. Semi trucks mired in ash. Bulldozers are working in some areas to clear the ash and rescue efforts are continuing despite the increasingly slim odds of survivors being found. In other locations, the ash remains too hot to navigate. Rain will only bring additional challenges. The country’s rainy season started in May, and so far it’s been fairly wet. Guatemala’s national meteorological service warned that rainfall this week would fall on already saturated soils and could lead to floods and mudslides, hazards that are normally bad enough. But forecasters also warned about lahars, a slurry of volcanic debris and water that can choke streams and waterways. Ash also absorbs a huge amount of water. A cubic meter of dry ash can weigh between 500-1,500 kilograms (1,100-3,300 lbs.) but that weight balloons to 1,000-2,000 kilograms (2,200-4,400 lbs.) once it gets wet, according to the U.S. Geological Survey. That’s hugely problematic for cleanup, which is itself hugely problematic for the thousands of people stuck in limbo.